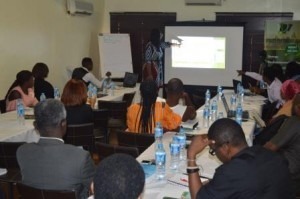 SPACES FOR CHANGE presented the findings of its multi-year energy sector research to a broad spectrum of stakeholders in the Nigerian oil and gas industry at a seminar held on June 21, 2018, in Lagos. The research focused on Nigeria, Bangladesh, India and Indonesia where governments are implementing substantial energy sector reforms to address lingering energy access issues. Around 22 participants took part, representing a wide cross-section of officials of the national statistical agency, donor agencies, energy policy designers, independent energy finance experts, oil company executives, media professionals, civil society leaders and women operating businesses in the informal economy. Presenting the findings of the study, S4C’s director, Victoria Ohaeri narrated the history of the organization’s involvement in the fuel subsidy reform discourse, beginning from 2011 when Nigeria’s petroleum subsidy bills rose to an all-time high up to the subsequent OCCUPY NIGERIA protests of 2012. Consistent with the organization’s mandate of investigating and reporting the stark inequalities in access to energy resources, the research reviewed the impacts of fossil fuel subsidies and their reform on the welfare, productivity and empowerment of women in low-income households. In addition, it explored how subsidies on petroleum products, particularly, petrol and kerosene, can be better targeted and redistributed in the future for the benefit and empowerment of low-income households, with women making up the majority of those on low incomes. SPACES FOR CHANGE conducted this study in collaboration with the International Institute for Sustainable Development | IISD with support from Energia. Laura Merrill, IISD’s Senior Manager, via video conference call stated that the aim of the research collaboration between the two organizations is to build evidence for informing energy subsidy policies. She advocated for the need to target subsidies better for the benefit of those without access to electricity and cleaner cooking fuels in the urban and rural areas especially the low-income and poor women. There are many lessons that Nigeria can learn from energy transitions and fossil fuel subsidy reform from other countries such as Indonesia and India. There are encouraging efforts in India to target subsidies better by reallocating resources towards the provision of LPG starter kits (cylinder and cooker) for poor women via their bank accounts. Countries around the world, including Indonesia and India, are therefore encouraging shifts in cooking away from biomass and kerosene towards cleaner cooking fuels and appliances—such electricity and gas. Nigeria needs to follow suit. Nigeria has 177 million people (6% of the global total) without access to clean cooking, the largest population after China and India. There is some way to go. Despite subsidizing petroleum products like premium motor spirit (PMS) and household kerosene (HHK), a large number of households do not purchase them at government-subsidized rates. Because of the numerous inefficiencies and accountability gaps in administering subsidies effectively, Nigeria has over the years, taken steps to reform its subsidy regimes on the two common petroleum products: premium motor spirit (PMS) and kerosene. There is evidence that reforming subsidies—whether by outright removal or reduction of the subsidies—on petroleum products lead to higher fuel prices, stirring public anger and resistance to reforms. There is very little information regarding how these reforms impact on women. There is a gap that needs filling from a research perspective and in order to help policy makers better target energy subsidies or savings from subsidies towards delivering better outcomes for women’s empowerment. This research was conducted to fill that knowledge gap. Household data surveys and focus group discussions were conducted in Lagos and Imo states. The survey in Lagos was conducted in two urban slums (Badia and Ebutte-Metta) while the Imo survey was conducted in 6 rural villages in Uzoagba community, in Ikeduru Local Government Area. Survey data was collected from individual respondents in residential and commercial buildings in the selected sampling units. Additional data was also collected from groups of respondents in focus group discussions (FGD) involving 56 women in Lagos and 27 in Imo. Overall, 2,500 household surveys across the three countries: Nigeria, Bangladesh and India. Out of this number, 1,000 households were reached in Nigeria. Similar to the findings of previous studies on energy use, the research found that kerosene is a primary energy source for cooking, cooling and lighting among low-income women in Nigeria. In the urban areas, other energy sources according to their order of usage are electricity, LPG and petrol respectively. In the rural areas, kerosene as their primary energy source for cooking, cooling and lighting, followed by firewood and electricity respectively. Mothers and daughters are primarily responsible for collecting firewood. This finding in Imo and Lagos is consistent with the historical constructs of gender roles in the family. Being predominantly responsible for cooking, fuelwood collection, and other chores, women have more need for energy for household use. Urbanization is also a major determinant of energy use, in terms of quantity and type of fuel used, with a number of studies showing disparities in household energy use between urban and rural areas, and between different income groups. Survey results further showed that the subsidy reforms and product shortages often trigger dramatic changes in energy prices. In event of shortages in products (kerosene and petrol) supply, women are the ones predominantly seen at filling stations, queuing for many hours to purchase the kerosene. During periods of scarcity, women in urban areas queue as much as 2 – 4 hours and sometimes all-day long. Time that would have been spent on other productive activities like trading or farming, are wasted on these queues. Product scarcity also forces women to resort to firewood and traditional biomass to cook. Over half of respondents say that they use less cooking fuel and switch to or use more biomass whenever there is increase in fuel prices. Women’s ability to cope with increases in the prices of fuel is largely influenced by level of income. Unlike women who earned higher income (above $200 per month), the majority of those who earn low-income (about $28) will use less cooking fuel and reduce their expenditure on other things if the prices of fuel increase. Another finding of the study is that low-income women access energy products (kerosene and petrol) mainly from informal vendors. Reasons for preference for informal vendors include proximity to their homes and businesses; accessibility and availability of products. Preference for a clean cooking fuel (LPG) increases as the level of income and education increases. The research found strong links between education, income level, household-decision-making power and access to (cleaner) energy. Respondents without education earns the lowest income, lack decision-making power in the household and have limited access to (cleaner) energy while it is exactly the opposite for those with higher level of education, especially post-graduate education. Proportional use of biomass fuel declines as the level of education increases, while the proportional use of clean energy (LPG) increases as the level of education increases. Energy preferences for cooking and lighting are also seen to vary with the level of education. There is evidence that government economic empowerment interventions designed to increase access to energy are not reaching the grassroots, particularly the low-income populations. The awareness of specific government support programmes for low-income households/women is extremely low in the sampling areas. Women cope with price increases by reducing fuel use, paying more, switching to old fuels with implications for health, safety and time. Women predominantly pay for the cheaper, less clean fuels. Reforms not effectively addressing the price differential between official pump price and retail prices of energy products, widening gaps in access to energy. Women bear the brunt of supply disruptions, including shortages, losing enormous of time at queues. The research results stirred a debate on a number of issues such as fuel-switching, renewable energy and the current status of fuel subsidy reform in Nigeria. There were suggestions about introducing additional indicators for measuring the extent of switch to biomass post-subsidy reforms. For instance, there is a booming firewood and charcoal market in Abuja, Lagos and across the country. Direct interviews or focus group discussions with firewood and charcoal vendors could reveal whether higher or lower sales of firewood are recorded post-subsidy reform, and this would help in determining the extent of shift towards biomass when energies prices increases as a result of reforms. There is evidence that Nigeria still incurs high subsidy bills on petroleum products especially PMS. Stakeholders disagreed on whether these subsidies should be removed or retained. Despite the dissension among stakeholders on this issue, there was consensus that women were bearing the brunt of inefficiency associated with subsidies and their reform. Subsidy reform causing certain behaviours and triggering responses that hurt women’s welfare and limit their economic empowerment opportunities. Not only that, there was agreement that investment in women education is necessary to improve women’s energy access, women’s transition to cleaner fuels and women’s energy decision-making. Stakeholders agreed on the recommendation for transition to LPG especially taking into account that the technology and infrastructure for this is locally available. Upfront connection costs need to be addressed especially the cost for the cylinder and the gas cooker. Safety concerns, particularly the fear of gas explosions and fire accidents in the home is one of the reasons many avoid LPG cookers. With sensitization, this fear can be overturned while taking precautions to address plausible harm to family or the environment. Overall, stakeholders were impressed with the depth of the analysis. According to an official of the National Bureau of Statistics, the parameters used in determining sample size, sampling areas gave research a solid foundation. The use of FGDs was very commendable as it enabled research team to develop cordial relationships with target groups and create the cordial atmosphere needed to enhance respondents’ cooperation and in turn, extract more data. Presenting the research results to stakeholders forms part of a broader strategy to share ideas, experiences and expertise in both the knowledge-generation and energy policy design domains. It is hoped that the outcomes from this research will enable governments make informed choices regarding the reform and implementation of energy sector policy in ways that lead to improved social, economic and other developmental outcomes for women.